A project at the Bemis Center envisions what it would be like to live or work in a temporary, nine-foot-across, space called a flock house. A flock house in New York City. The Flock House Project Omaha opened last week at the Bemis Center for Contemporary Arts. 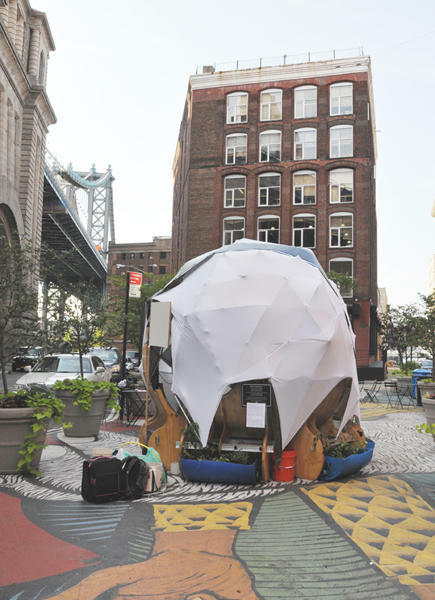 A flock house is a spherical, movable structure that you can live or work in. Amanda McDonald Crowley, curator of the project, says it’s the inspiration of New York-based artist Mary Mattingly. "It’s a live-work space, but it’s a temporary space. The idea behind it is that Mary was looking at ways that we might develop a sustainable living environment for growing food, water collection, generating electricity, all in one structure." One flock house is set up in the Bemis Center gallery, and work is underway on another. The Flock House Project Omaha is open through August. More information is available at www.bemiscenter.org.